For a larger size, here’s the direct link to the picture. For even larger, use your browser’s zoom feature (eg, CTRL +) or use your favorite image app. As you can see, the overall trend is for prices to drop, especially among the more competitive segments. 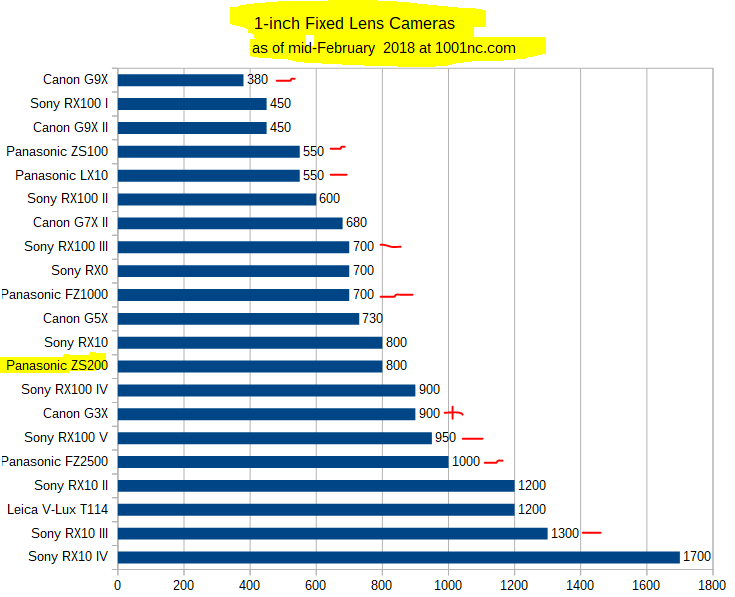 On the other hand, cameras like the Sony RX1-series and the Sigma DP-series are in a league of their own and prices are at the mercy of the manufacturer. But still, just like DSLRs and mirrorless there is no price range to the bottom. The majority of the RAWsumers remain cameras with short zoom, but the superzooms continue to increase. The only new addition we had since November 2017 was the Panasonic ZS200. We lost zero cameras since then. It still amazes me how Sony is managing to keep all the RX series cameras, in all three lines still alive and kicking. 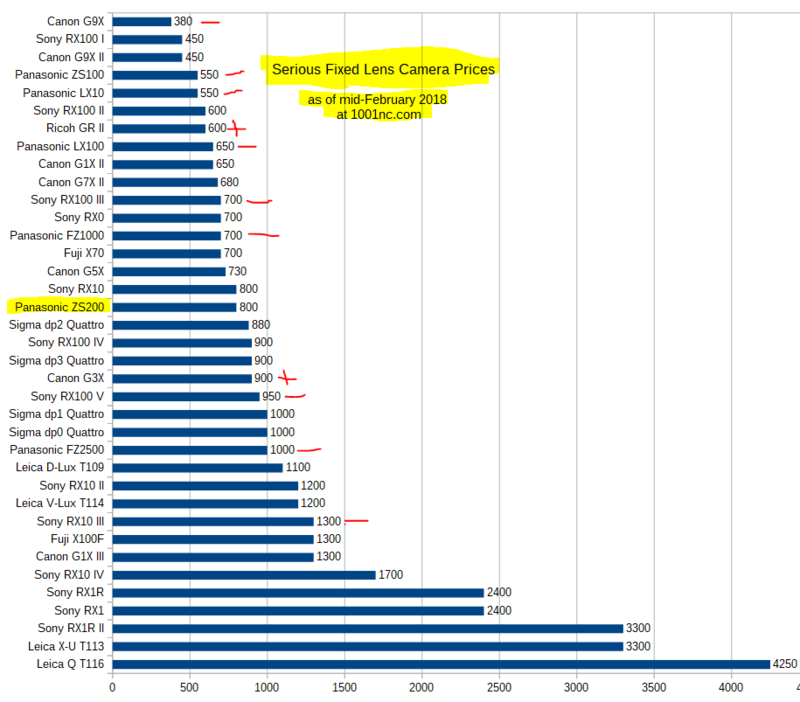 The latest price changes broke the symmetric price-staircase pattern of the RX100 series, mayhaps the fallout of the Mark V having disappointment a segment of the RAWsumer fandom. As you can see in the chart below, all is quiet on the APS-C front. Except for a small price increase, the prices remained the same. The Fuji X70 is on its way out, as of this update, only Amazon has it available. It is gone and unorderable from B&H and Adorama. Once upon a time the 1/1.7″ sensors reigned supreme in this segment. Now the 1-inch sensors are the most common. A little bit over half of the cameras in this group (37 of them) use 1-inch sensors. There’s a lonely Canon with a 1.5″, a couple of M43rds, and four full framers (Sony RX1* and Leica Q Typ 116). 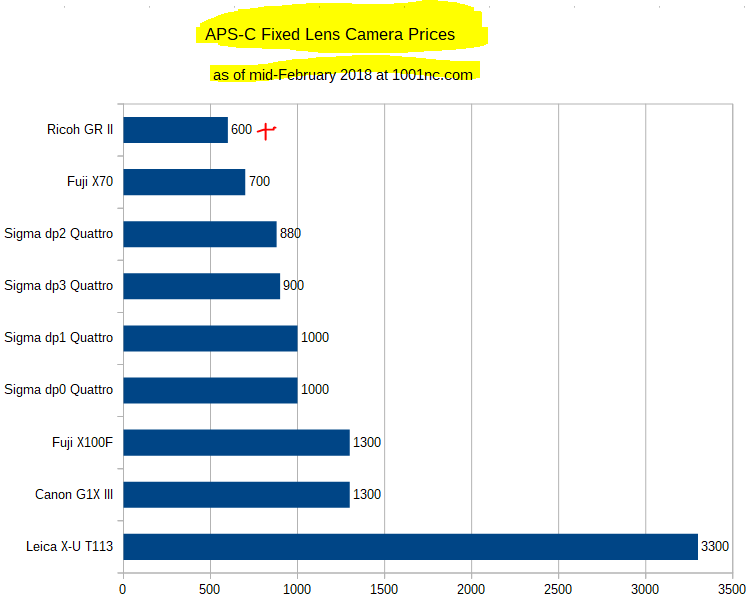 The prices are the consensus prices between Amazon and B&H Photo and Adorama as of February 23 in 2018. These are new condition with USA warranty prices, from authorized dealers. All the prices are the body only kit prices. Older cameras that are no longer available in new condition with USA warranty from the above retailers, or are available in a very limited fashion, are not included.